The Biodiversity Articles Mapper is a mapping tool for geo-located scientific articles. This project originated from a collaboration between the Quebec Centre for Biodiversity Science (QCBS) and Zoological Record at Thomson Reuters. Zoological Record has a team of zoologists who retrieve animal names and place names from scientific papers, among other information. 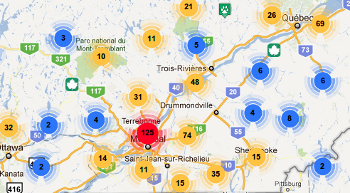 All data available at Zoological Record for the province of Quebec, Canada, was used to generate BAM!. THIS CONTAINS ONLY INFORMATION PERTAINING TO ANIMALS (NOT PLANTS). Animals names are linked to the Index to Organism Names website, which provides more information on each species or species group. Why are links to Zoological Record not functional? Zoological Record is a product of Thomson Reuters that is available on an institution subscription basis. Please contact your respective institution if you would like to have access to Zoological Record. How is the geocoding done? All place names found in the database were geocoded (attributed a latitude and a longitude) with the Google Geocoding API. Latitude and longitude information are not extracted from the publications by Zoological Record. How are vernaculars identified? Why is some information wrong or missing? For vernaculars and Class information, the Integrated Taxonomic Information System (ITIS) database was linked to the BAM! database. Missing French names, English names or Class information are simply due to missing entries in the ITIS database. How are multiple records for the same location treated? What computer programs were used to create this tool? How can I help to improve this data? For the moment, you can simply send an email to guillaume.larocque@mcgill.ca with additional entries and/or corrections. For corrections, please include the ID of the reference,the small number that appears on top of the information window associated with each marker. Please send corrections to locations as well as English and French vernaculars.